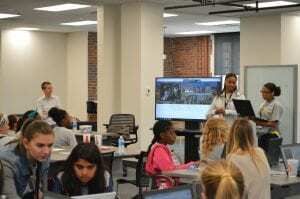 I feel so fortunate to have been able to lead a workshop on data visualization and storytelling for the Women in Data Science Summer Camp this summer at Ohio State. 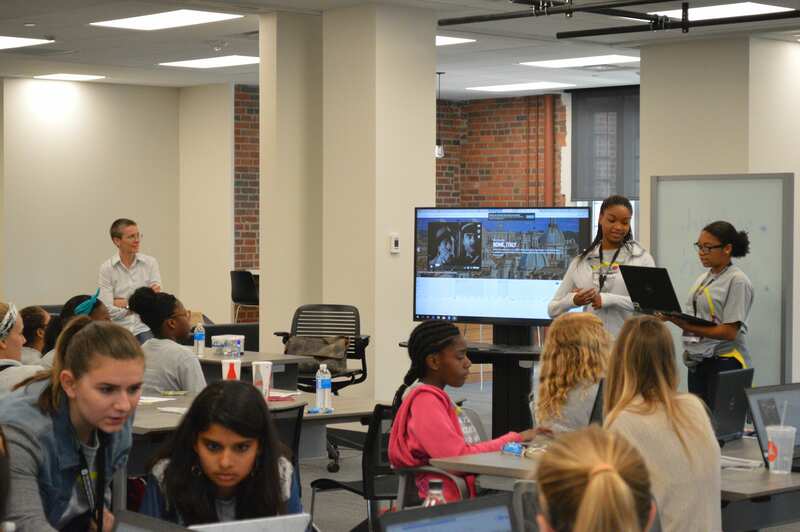 This free program, directed by Jenna McGuire and hosted by the Translational Data Analytics Institute, offers young women (grades 8-10) in Columbus an opportunity to explore data science through presentations and workshops with OSU faculty, staff, and students. I was able to put together a hands-on workshop for these young women using materials that Kate Elswit and I have collected and generated for Dance in Transit, focusing just on African American choreographer Katherine Dunham’s touring in 1950. Using TimelineJS designed by the Knight Lab, the workshop participants created their own digital timelines representing the data they gathered on Dunham’s travels and activism in 1950. This includes her lawsuit against a hotel in São Paulo, Brazil for racial discrimination, and her premiere of the controversial work Southland in Santiago, Chile. The task of creating a timeline was fairly simple, but I asked workshop participants to use copies of archival documents and historical materials to create their data set. I provided them with copies of concert programs from Paris, New York, and São Paulo, newspaper articles, and letters, all from 1950, so they could piece together a Dunham story of their own. 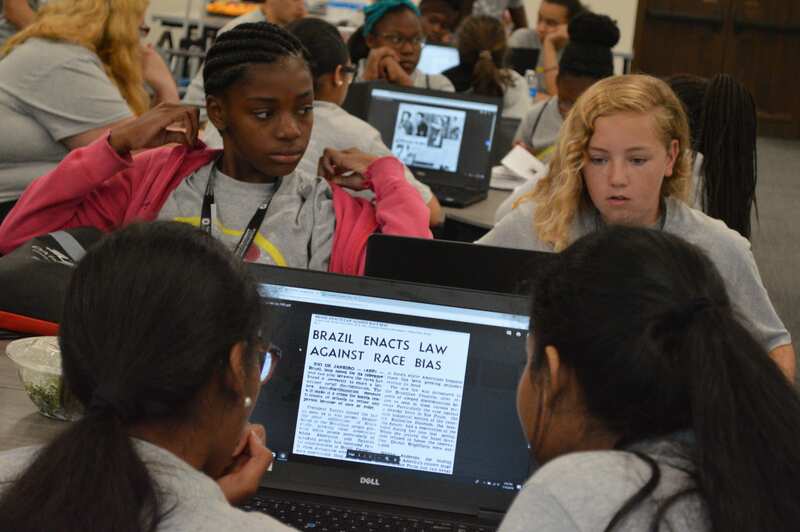 In the process of putting together a digital timeline about a single individual, they learned a little about working with archival resources, creating data sets from historical documents, understanding the history of racism in the Americas, and recognizing the ways arts-based political activism can fuel social change. 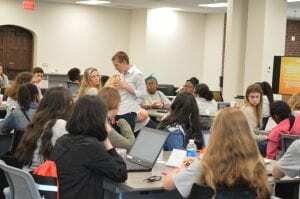 This workshop was hugely gratifying for me, and I enjoyed sharing ways that the arts, humanities, and computing can be complementary modes of research. I hope this camp inspires these young women to further develop their interests in data analysis, and I hope to see them at Ohio State in a few years! Harmony Bench and Kate Elswit will be presenting at the 2018 International Federation for Theatre Research conference in Belgrade! What we are presenting at comes at the end of our pilot project, Dance in Transit (funded by BETHA, 2016-18) and just as we begin Dunham’s Data: Katherine Dunham and Digital Methods for Dance Historical Inquiry (funded by AHRC, 2018-21). These projects extend our work on the geography and networks of historical dance touring and transmission (see Bench and Elswit, 2016), through the exemplary case study of African American choreographer Katherine Dunham (1909-2006). Dunham worked across five continents in many contexts, from her early anthropological research in Haiti to her curatorial and administrative projects later in Dakar, New York, and St. Louis. She choreographed and performed in operas, revues, Broadway shows, Hollywood films, and modern concert dance. She was also an extraordinary self-archivist. In this presentation, we will show some data visualizations generated from daily travel data collected from primary resources documenting Dunham’s whereabouts from 1950-1953. We will also talk about what it means to track a single person’s movements every single day for four years (1461 days), the gaps and absences in the historical record, and the scholarly investments in mundane, personal, and behind-the-scenes information that emerged from this process. Kate Elswit (PI, University of London, Royal Central School of Speech and Drama) and Harmony Bench (CI, The Ohio State University) have been awarded over £566,000 by the Arts and Humanities Research Council (AHRC) for their research project Dunham’s Data: Katherine Dunham and Digital Methods for Dance Historical Inquiry. Elswit and Bench are co-authors of the first essay on digital analytics for dance history, and Dunham’s Data extends their previous development and implementation of archival databases and digital cartography. Together—and with international academic partner projects and UK industry partnerships with One Dance UK’s Dance of the African Diaspora and the Victoria & Albert Museum—they will pioneer the use of data analysis in dance history through a project that centres on the case study of African American choreographer Katherine Dunham (1909-2006). Dunham is an exemplary figure for analysing the ways dance moves across both geographical locations and networks of cultural, artistic, and financial capital. She worked across five continents in many contexts, and also spent over one third of her life on tour. The scale and distribution of datapoints necessary to research the transnational circulation of an artist like Dunham pose a challenge for traditional scholarly approaches. Using digital research methods and data visualization in the context of dance history can catalyse a better understanding of how dance movements are shared and circulated among people and continents, and the networks of support and influence that undergird artistic and economic success. While digital methods have altered the landscape of most humanities and arts disciplines, the field of dance studies has yet to fully identify how it can benefit from these analytic approaches. Therefore, this project is not only devoted to the specific line of research regarding Dunham, but also to the original problems and questions of dance history that can be advanced through an innovative critical mixed methods approach that includes geographical mapping and network analysis. A portion of this new project has been piloted with support from a Battelle Engineering, Technology, and Human Affairs Grant. See Movement on the Move (www.movementonthemove.osu.edu) for more.